A&L Goodbody has been acknowledged for its high standards in information security with the internationally recognised ISO 27001 Certification. 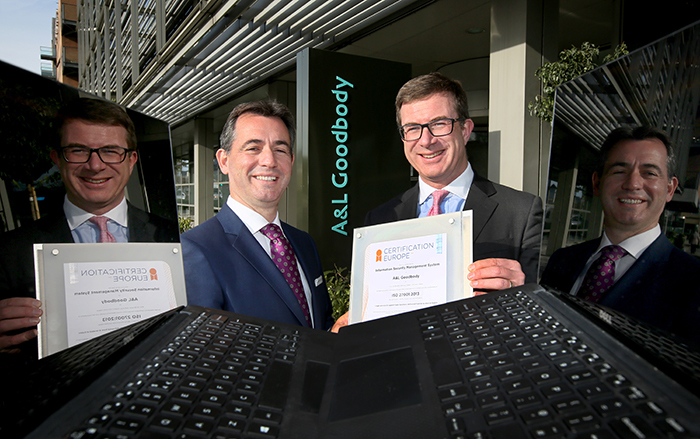 The certification reinforces A&L Goodbody's commitment to protecting its information from security threats such as cyber-attack, misuse, theft, vandalism and terrorism. The ISO is the developer and publisher of International Standards and ISO 27001 is the globally recognised framework for managing risks to the security of information. A rigorous auditing process, conducted by Certification Europe, has resulted in A&L Goodbody achieving a full scope certification. "Protecting information in today's environment is one of the biggest challenges businesses face. Achieving this ISO certification shows that we are doing all we can, set against international best practice, to make our data and that of our clients as secure as it can be. It's clear to us that clients want to engage with firms who have the highest standards in data protection, and we believe that achieving ISO 27001 provides them with that comfort." The Standard provides a best practice framework within which an organisation can manage and mitigate risks associated with information security. The Standard adopts a process-based approach for establishing, implementing, operating, monitoring, maintaining, and improving information security management systems.